Impact Mapping is a goal-oriented requirements practice, largely described in the book Impact Mapping - Making a Big Impact With Software Product and Projects by Gojko Adzic, on which this post is based. Do not be deceived by the title of the book; the Impact Mapping technique can be applied proficiently to all kind of projects, in different industries. The idea is that each deliverable in a project should be graphically linked to a well-defined business objective, which shall be achieved through the impact users will create by using the deliverable itself. The graphic representation is considered paramount, in order to clarify links that may be well defined just in the back of the mind of an executive and to show assumptions that may benefit from some investigation. I believe Impact Mapping to be very close to the Prince2 view of "Outputs", "Outcomes", and "Benefits". So I recommend considering the Impact Mapping approach when using Prince2 Methodology. 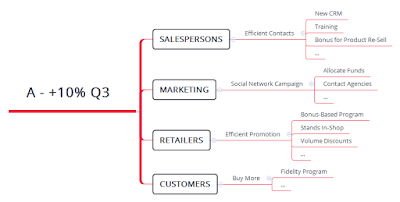 To start creating an Impact Map, you shall begin fixing a business objective in the main node of a standard mental map. As an example, we could start with the objective "Increase our quarter sales of product A by a 10%". Obviously, remember to consider just SMART objectives, to be able to create real value. The second step in creating an Impact Map is to identify key people that will help you to reach the objective. Basically they are internal and external stakeholders of the project, who will create the impact you need to achieve the goal. Referring to the fictional objective stated in the previous paragraph, we could identify "Salespersons", "Marketing", "Retailers", and, obviously, "Customers". The ability of the stakeholders to create an impact through the utilization of the deliverable(s) is paramount. If stakeholders cannot produce the expected impact, the purpose is defeated. The third step consists in defining how the identified key people can make the impact we need. Referring to the previous example, "Salespersons" could increase the frequency of their contacts with the customers, "Marketing" could start a new campaign on social networks, "Retailers" could promote our products in more efficient ways, and so on. Obviously, more than one "How" should be identified for each "Who". Pay attention to this point because it can be a little tricky. The definition of "How" is hard-wired with some assumptions. We assume that key stakeholders are able or willing to create the impact we need. Such assumptions must be continuously checked and validated and, if proved to be false, requirements dropped. The last step is to identify what we can do to enable stakeholders to create the impact we want from them. 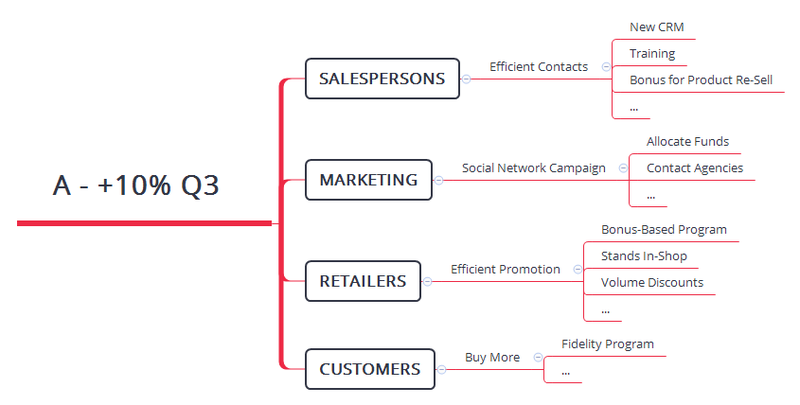 Coming back to our example, we could deploy a more sophisticated CRM to help "Salespersons" achieving greater efficiency, allocate some budget for a marketing campaign, and implement a bonus-based engagement program for "Retailers". When creating the map, I recommend a kind of brainstorming approach. Create a comprehensive map to start, and then prune the tree, removing redundant branches or parts not well sustained by solid business reasons. Moreover, compare Impact Maps with different central objectives, to find requirements that support more than one business goal. Search for synergies between business objectives, remove useless paths, enforce multi-purpose requirements, and remove duplicates. There are several benefits achievable by using a goal-oriented requirements practice, such as Impact Mapping. Every requirement is strictly connected to a business case, so, If we drop the business case, or if we prove it to be no more valid, we can drop the feature itself. If a business case is already well-addressed by enough features, we can drop some requirements and invest in other areas of the project. Scope creek avoidance. The scope is controlled following a quantitative logic, so it is very difficult for pet-features to sneak in. For a better insight in the technique, I recommend you to read the book, Impact Mapping - Making a Big Impact With Software Product and Projects by Gojko Adzic, which contains some very good points and insight in project management.